Originally started by Denise Hales and Peter Fox in 2000, now owned and operated by Amanda Dietrich and her family. Boabs in the Kimberley is situated in Kununurra in the East Kimberley’s Ord Valley. The boab tuber is unique to the Kimberley and unlike most bush food is available all year round. The tuber we use is the tap root of young boab trees. It adds a great crunchy texture to the chutneys and jams. The tuber is very similar in texture to water chestnuts. Wherever possible I use the freshest home grown produce either grown here on our property or from other growers in the Ord Valley. Please take the time to explore this website and this the information presented here. I hope you enjoy this exclusive range of products products as much as I enjoy making them. 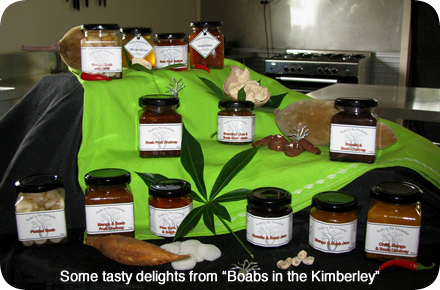 Savour the taste of Australia’s beautiful Kimberley. When I was in Kununurra a couple of years ago, I bought several jars of wild rosellas in syrup from the store. Subsequently I ordered a dozen jars from Denise Hales. They were used to liven up our champagne drinks at the end of the day! We’d like to re-order, and wonder if you still sell them, and the cost. Please reply to my email address – we live in Melbourne. I have recently learnt that the boab tubers are a good replacement for jicama. Do you sell on-line and what would be the approx cost for 500grams and shipping/delivery time?